Ever tried a pasta tasting menu? 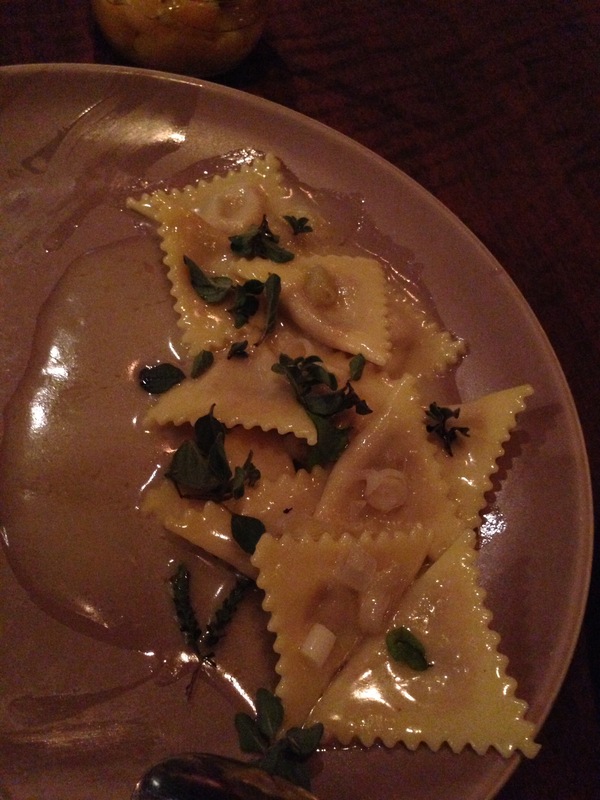 Neither had I, before I tried the summer pasta tasting menu with wine pairing at San Francisco’s Flour and Water. Not your typical Italian joint, Flour and Water’s exquisite menus for omnivores and vegetarians alike. The experience is worth the investment. Chef Thomas McNaughton wows patrons with regularly changing menus that take high Italian cuisine to another level. With tempting antipasti, pizza, and protein-based main courses, ordering a la carte would be easy, but to miss the pasta tasting menu on a first visit is almost criminal. The six course (plus “spuntini” starter) menu is an airy and beautiful collection of pastas that are anything but traditional or ordinary. On this occasion, my friend and I couldn’t pass up the summer pasta tasting with a wine pairing that showcased wines from northern Italy. 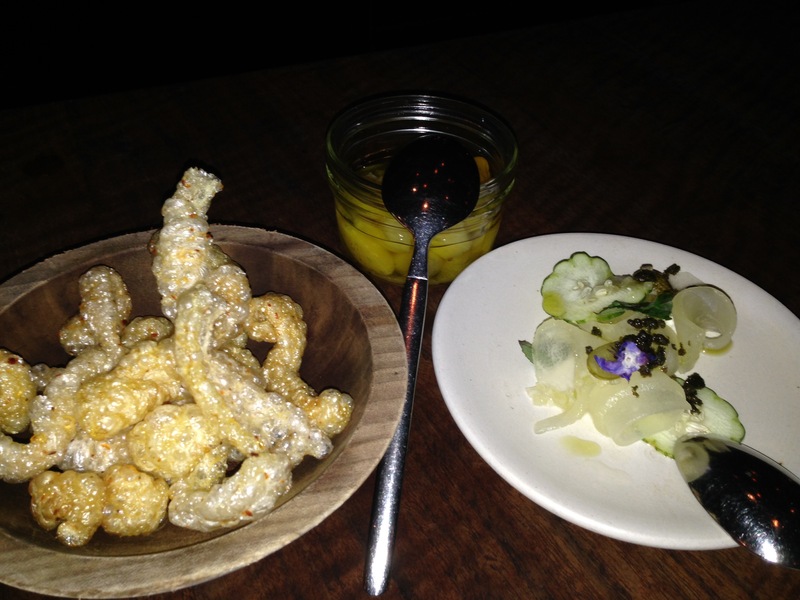 The meal began with the spuntini: pickled yellow Cherry tomatoes; a re-imagining of pork rinds, and a sort of cucumber carpaccio. It was paired with a non-vintage sparkling wine made in the methode Champenoise with Chardonnay and Pinot noir grapes. Next came pasta triangles, stuffed with fresh from the garden pepperonata with leeks and oregano. Simple did not mean flavorless; it was paired with a full bodied white wine from Liguria made from pigato grapes native to Italy. 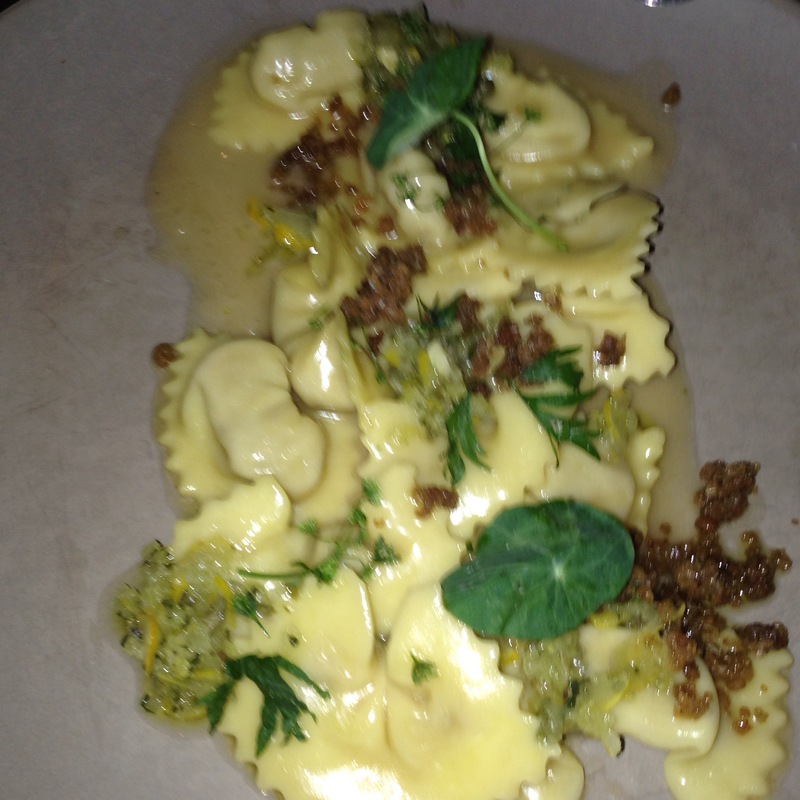 Course two was an unexpected tortelloni-like cappelletti pasta stuffed with halibut in a light broth. I am not usually crazy about fish, much less the idea of it inside pasta, but I was pleasantly surprised. 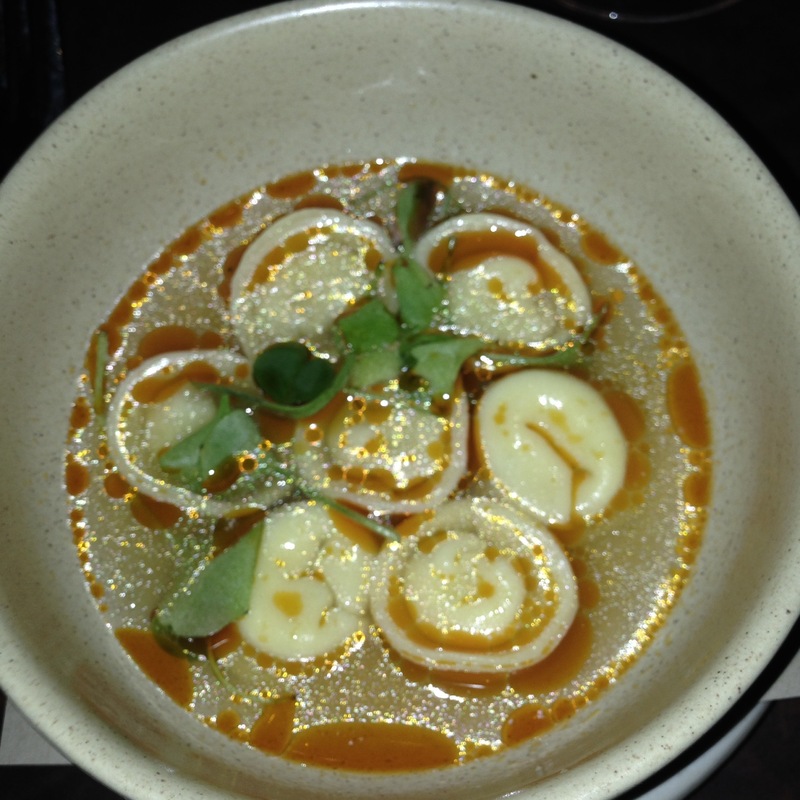 The halibut had a very subtle, smoky flavor, and the broth added a mild, light enhancement. 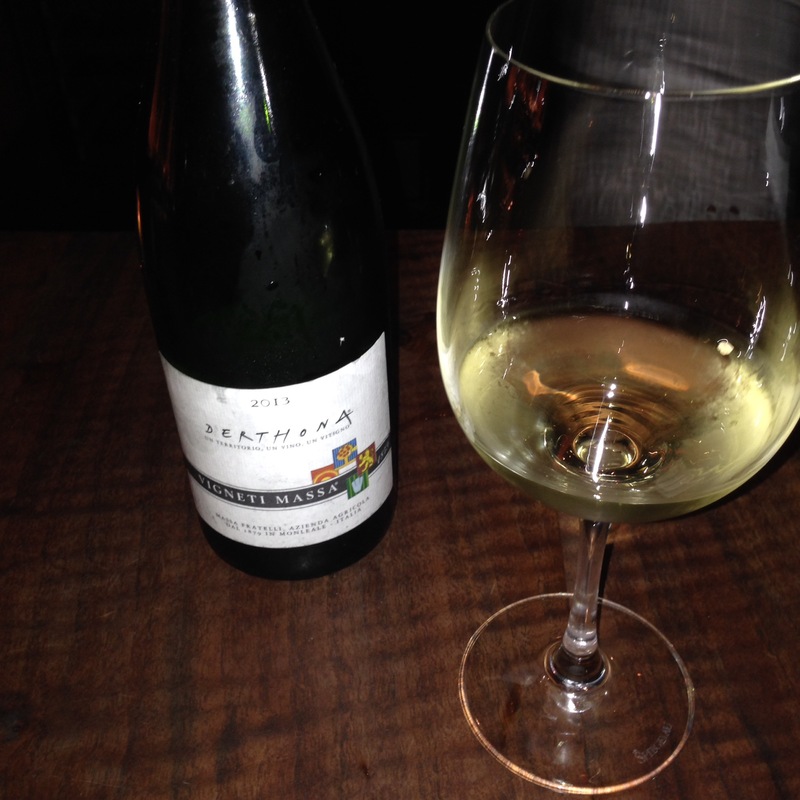 The wine was another native Italian grape, timorasso, which is in the midst of a rebirth after nearly becoming extinct. Though aromatic, with a hint of stone fruit like a Muscat, it was overpowering for me. A few Italian acquaintances later noted the producer was one of the weakest in Piemonte and advised me not to judge this grape negatively. Course by course, the meal built upon itself with increasingly bold flavors. Course three consisted of amazingly delicate duck casonei pasta topped with bacon and bitter artisanal greens. We moved to a deep rosé wine – darker than some red wines – from the coastal town of Portofino in Liguria. 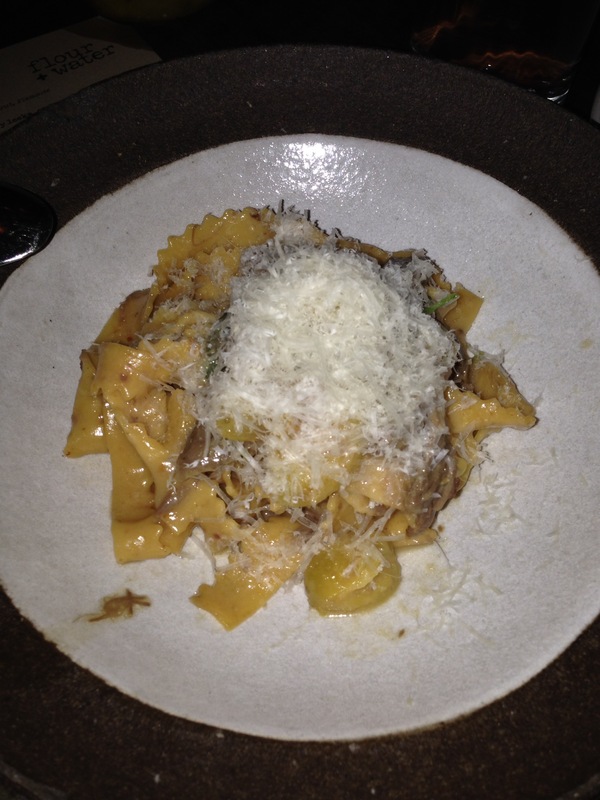 Course four was the first non-filled pasta: thick ribbons of pasta like pappardelle with a hint of mild Aleppo pepper topped with a rich rabbit ragu with a welcome tartness of Meyer lemon. It was paired with a red wine from Piemonte, made from the esteemed, musky and tannic Nebbiolo grape. Course five was an even bolder black trumpet orecchiette pasta with veal, shishito pepper, and less noticeable, charred corn. It was a complex combination of Unami, sweet, and spicy flavors. It was paired with an acidic, red teroldego (first time I’d ever heard of that obscure grape) wine from the mountainous region of Alto Adige bordering Austria. 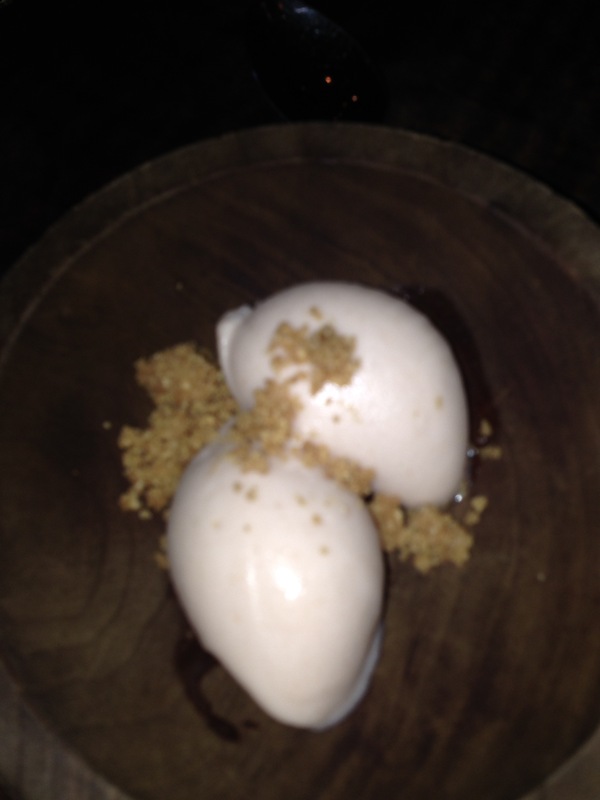 We concluded with a light dessert of stone fruit sherbet topped with crumbled hazelnut shortbread cookie and with a rich but not too sweet Asti Spumante from Asti in Piemonte. The portions were fairly small and manageable; I didn’t leave with that uncomfortably stuffed feeling one usually has after an Italian meal in the US. But it’s worth noting that your entire party must do the tasting, and most courses end up as a shared plate. So if you don’t like your dining companions (or one of you eats slowly), you might leave feeling gypped. The wine portions for the pairing, on the other hand, were far more generous. 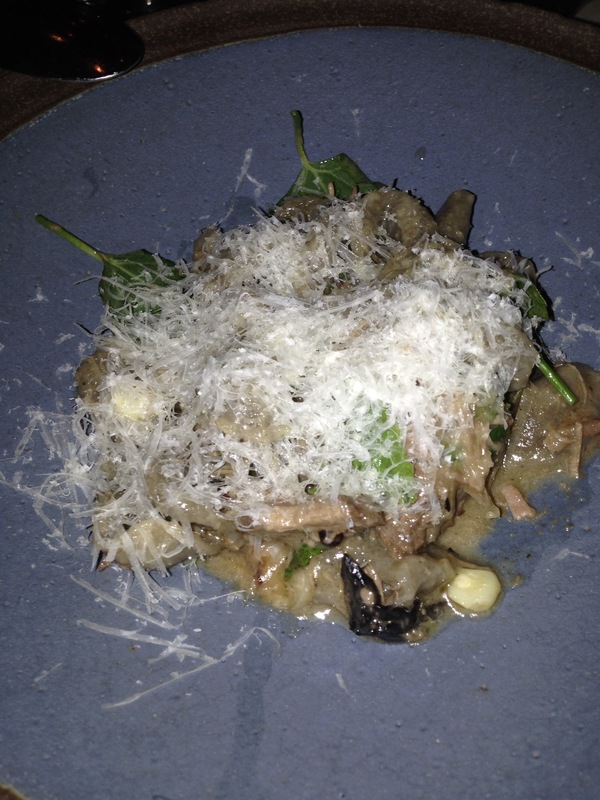 Portions aside, the pasta tasting menu at Flour and Water should be on any foodie’s bucket list!